South Portland Mayor Tom Blake, left, is joined by City Clerk Susan Mooney and Corporation Counsel Sally Daggett during a City Council meeting Monday night. The council considered a proposed ordinance that aimed to block the transportation of bituminous oil through the city's port. 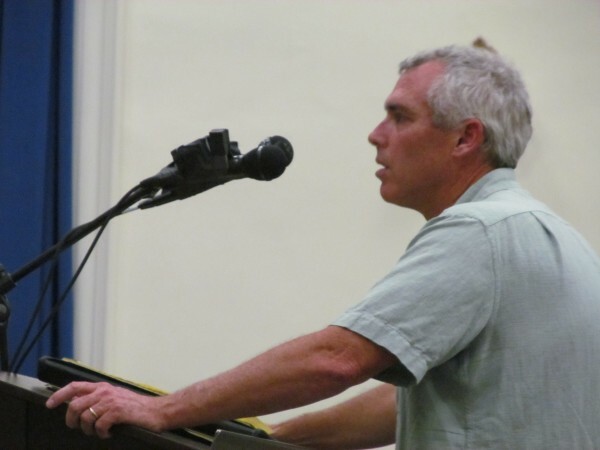 South Portland resident Robert Foster urges support of a proposed ordinance that intends to prohibit the movement of bituminous oil through the city's port during a City Council meeting Monday night. Chris Gillis, a longtime employee of the Portland Pipe Line Corp., tells the South Portland City Council Monday night that his company is a "good corporate citizen" that pays $700,000 in local property taxes each year. An oil conduit leads away from the Portland Pipe Line Corporation's terminal facility on the South Portland waterfront Friday, Feb. 1, 2013. Currently, imported oil for refineries in Ontario and Quebec flows from east to west via the Portland­-Montreal Pipe Line. Concerns involve reversing the flow of crude oil from west to east between Sarnia, Ontario, and Montreal, Quebec. This would allow crude oil from Canadas tar sands deposits near Fort McMurray in Alberta to flow east to oil refineries in Ontario and Quebec. Critics fear a similar reversal of flow will carry the crude through Maine for export at Portland. SOUTH PORTLAND, Maine — The battle over whether transportation of so-called tar sands oil should be allowed through Maine came to a head Monday night in South Portland, where the City Council considered an ordinance intended to block the controversial fuel once and for all. Maine’s fourth-largest city has become the epicenter in the fight over piping the corrosive — but potentially lucrative — bituminous oil through the state to Atlantic Ocean tankers. The recently organized group Protect South Portland collected 3,779 signatures on a petition calling for the new ordinance, four times the number necessary to legally force city councilors to either enact it outright or defer to a citywide referendum. As was expected leading into the Monday night meeting, the council chose the latter, voting to place the ordinance on the Nov. 5 ballot, where South Portland residents will decide its fate. Approximately 350 people turned out at the meeting, which was held in the Mahoney Middle School auditorium to accommodate the large crowd. Despite Mayor Tom Blake’s instruction that audience members not slow the progression of speakers down by clapping after remarks, applause erupted after each of about 65 individuals offered testimony on both sides of the issue. People from as far away as Auburn and Portsmouth, N.H., made the trip to South Portland to speak at the hearing. Opponents of the anti-tar sands ordinance argue it would buck federal laws protecting interstate commerce and pipelines, and that it would overshoot its target. Not only would it kill the potential for bituminous oil transportation through South Portland, but all less-controversial waterfront oil business activity as well, American Petroleum Institute attorney Harry Ng wrote in a letter to city Planning Board members last week. 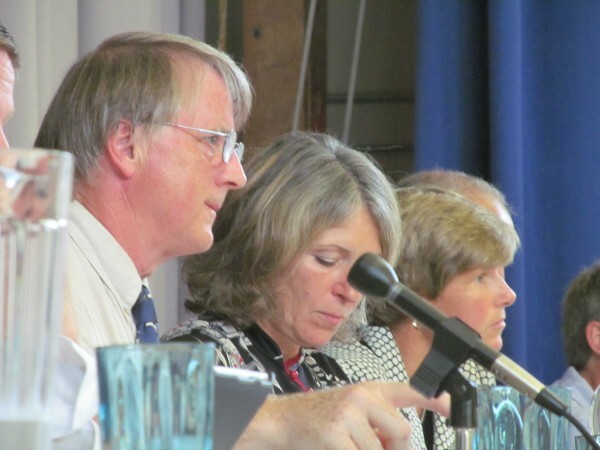 Dave Cyr of the Portland Pipe Line Corp. acknowledged that the majority of the speakers who turned out for more than four hours of public testimony Monday night were in favor of the new waterfront rules. But he disputed Sellin’s characterization of ordinance opponents as almost entirely highly paid out-of-state attorneys. While several cities and towns along the pipeline have adopted nonbinding resolutions protesting the movement of the bituminous oil through their communities, the South Portland ordinance is viewed as the only measure that could actually prevent it. 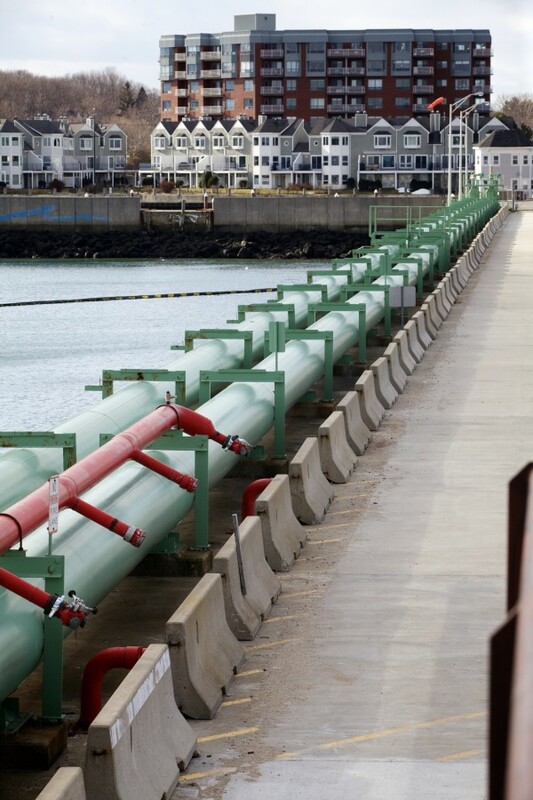 If enacted, the proposed South Portland ordinance would prevent upgrades to the pier near Bug Light that would be necessary if Portland-Montreal Pipeline owners decide to reverse its flow and transport the oil from Canada to South Portland. Among the alterations opponents find most offensive are twin 70-foot smokestacks, discussed previously as part of a 2008 pipeline reversal plan that fizzled. Currently, the 70-year-old, 236-mile-long pipeline transports crude oil from tankers off the coast of South Portland to Montreal. 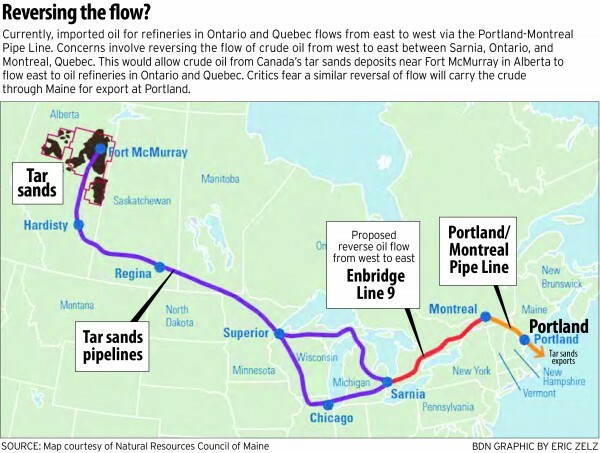 Those seeking to enact the ordinance believe it’s just a matter of time before the Portland Pipe Line Corp. pursues plans to pump in the opposite direction and move bitumen from the oil sands of Alberta, Canada, to international markets through the South Portland waterfront. Portland Pipe Line Corp. CEO Larry Wilson has repeatedly told reporters the company has no current plans to reverse the pipe’s flow or develop its South Portland facilities to accommodate the Canadian oil. But he has also acknowledged that the company is open to any move, including reversing the flow of the pipeline, to remain financially viable as global energy markets shift. Pipeline representatives have also been quick to point out that the company is a key economic engine for South Portland and the state of Maine. Chris Gillis, a longtime Portland Pipe Line employee, told the council Monday his company has been “a good corporate citizen” which annually contributes $700,000 in local property taxes, spends $4 million on local contractors, pays out $5 million in local wages and attracts $3.7 million in economic activity through the tanker ships that use the pipeline’s South Portland facility. Environmentalists have opposed the extraction and transportation of the bituminous oil, in part because they say the more corrosive and acidic oil mixture has a greater chance of wearing down pipes and causing toxic leaks near sensitive ecosystems or water bodies. Nationwide, TransCanada Corp.’s proposed Keystone XL pipeline — which would carry the controversial oil sands bitumen from Alberta across a delicate Nebraska aquifer on its way to the Gulf of Mexico — has remained a lightning rod for debate over the issue. Locally, the Portland-Montreal Pipeline passes by a cove of Sebago Lake, which provides drinking water to about 15 percent of Maine’s population. “We always want to see the local economy grow. Who doesn’t? But at what cost?” said local resident Paul Leddy Monday night. Multiple speakers in favor of the ordinance Monday night referenced spills elsewhere in the country such as a 2010 bituminous oil leak from a pipeline near the Kalamazoo River in Michigan that polluted 40 miles of the waterway and is still the focus of environmental remediation three years later. Before casting their votes, members of the City Council Monday spoke on both sides of the issue. Fellow councilor Linda Cohen disagreed, saying trucks, ships and trains can have oil-spilling accidents just like pipelines can, but that “I have to have some faith that there are regulations in place” to ensure the safe management of the pipeline. “This ordinance just goes too far,” she said. The council voted 5-1 against enacting the proposed ordinance demanded by the citizens’ petition, effectively placing it on the November ballot for voters to ultimately approve or deny. 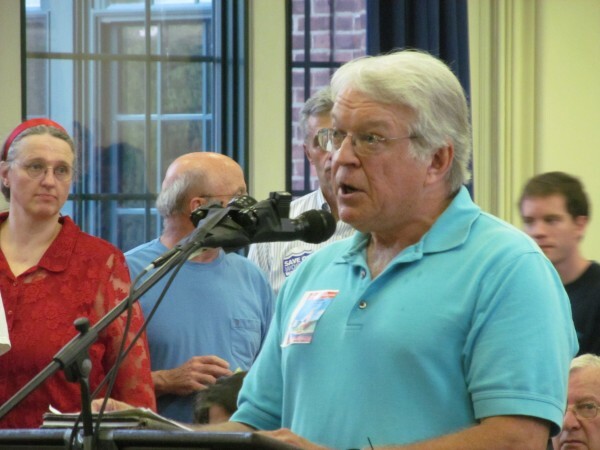 Smith represented the one vote in favor of enacting the ordinance without going to a referendum. BDN Business Editor Whit Richardson contributed to this story.